Early this year, I got into watercolor. I don’t know what possessed me actually. It might be the fact that I was obsessed with Sakuem’s mixed media art, and I wanted to emulate it using the stuff that I have. 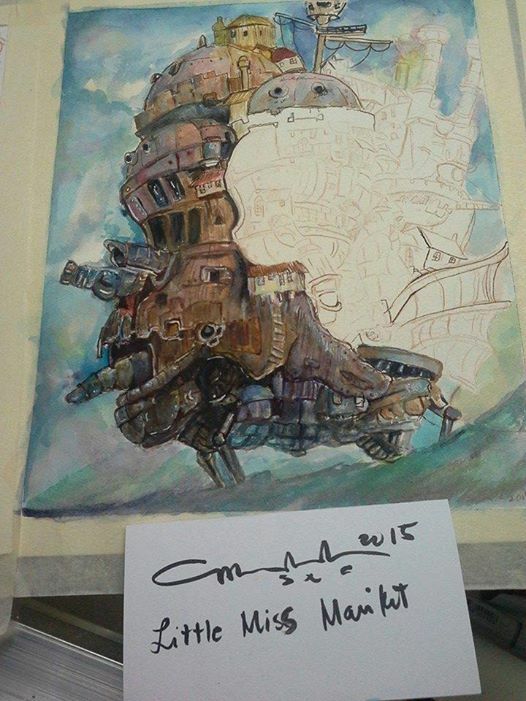 It might have also been the fact that I have been watching Ghibli. 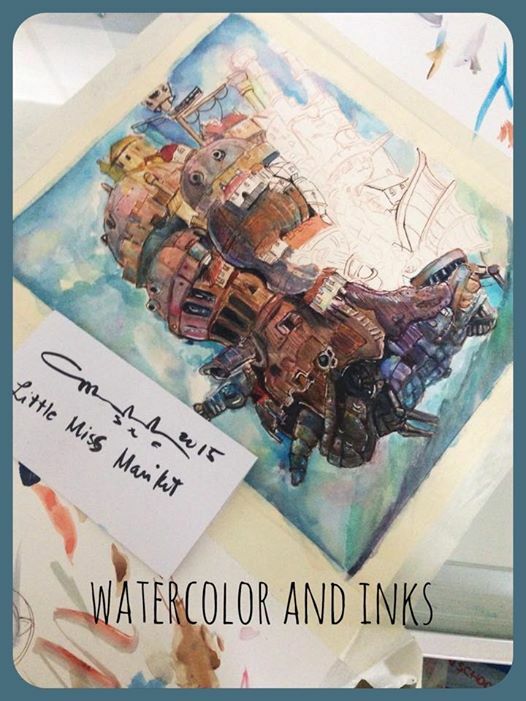 Miyazaki’s creators use watercolor to express their art and I was obsessed with the soft look it has. OR it might be that copic refills were getting rare and expensive and it was hard to get them. OR All of the above. 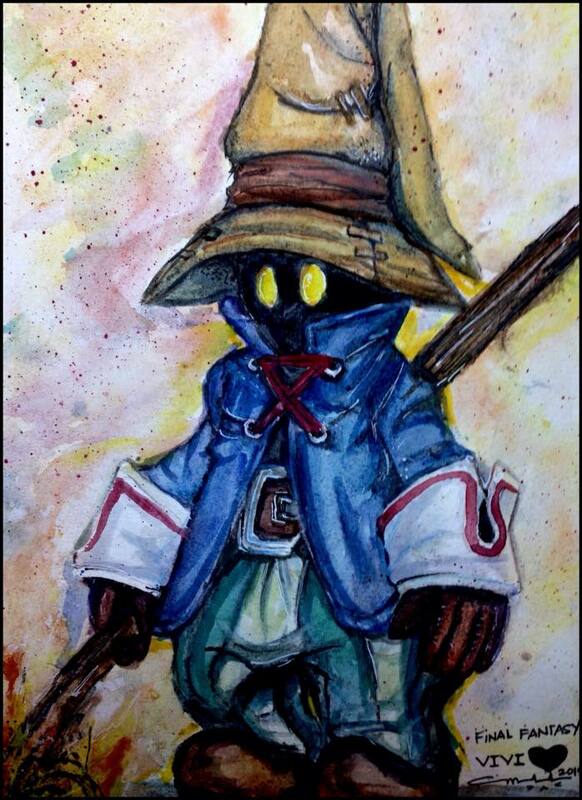 So I ventured into watercolor once again. I used to dislike getting out my gear to paint. It was bothersome to clean up too, but I discovered a love for it after I challenged myself to create my fantasy worlds. The former posts had lumen in it. 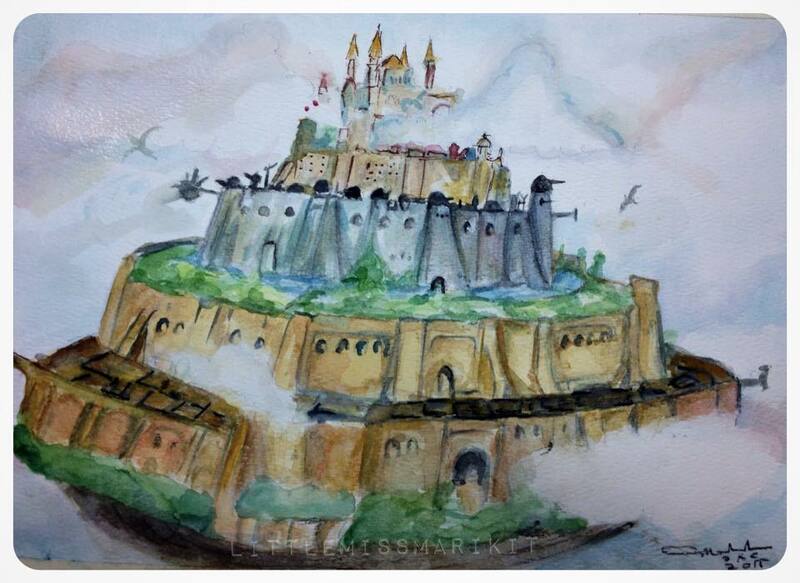 It was one of my earliest watercolor creations this year. 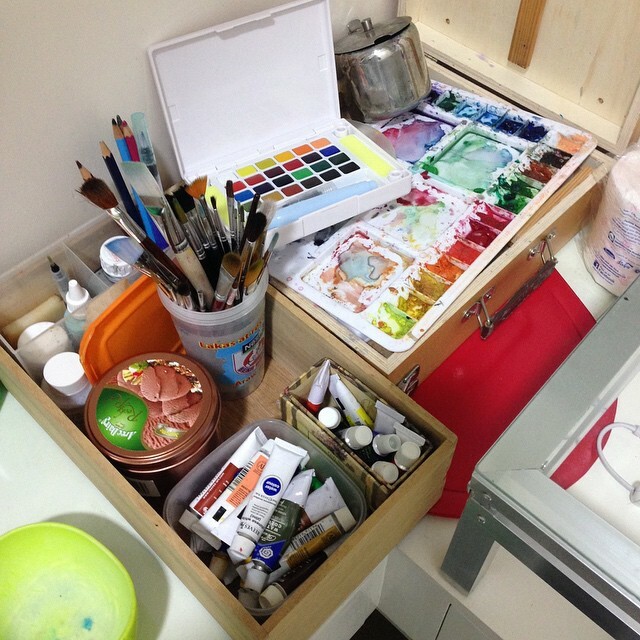 I’ll be dumping here some of my watercolor work and what I learned from each one. I hope you enjoy. I usually do not draw backgrounds. It’s boring. But I saw Ghibli’s backgrounds and I fell in love. Particularly with Howl’s moving Castle. It was breathtaking. Calcifer’s castle form was just WOW. Something I want in my life. So I started drawing that and painting it. Challenging myself to create something so I can hang it in the studio. i learned a lot about patience and detailing . I had to try referring back to my inking skills and really go into the tiny details and using my ‘accidents’ as inspiration for the next part. It took me nearly 4 days to complete and it was even on unforgiving paper, but I managed to do it. 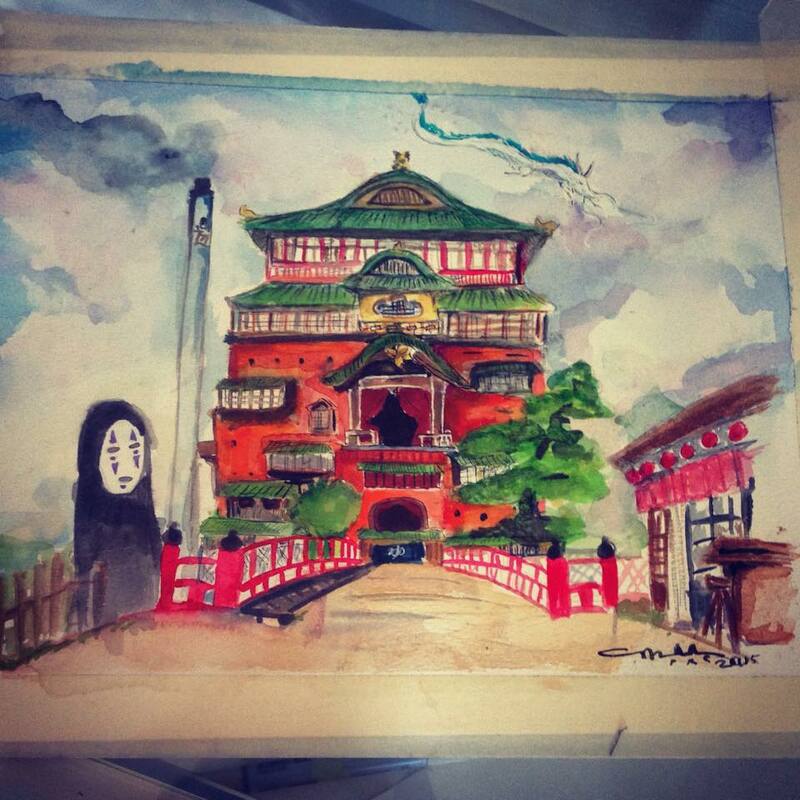 It was my version of a Ghibli classic. And I am proud. of it. Check out the thumbnails on how I made it. It’s pretty cool. 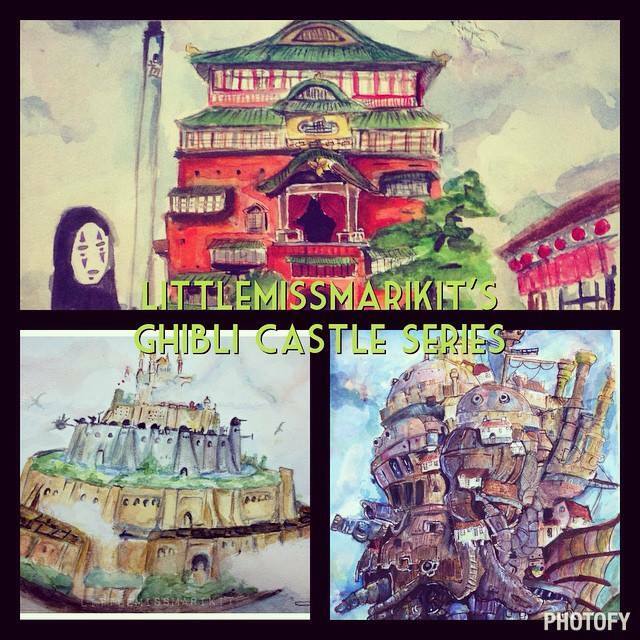 It encouraged me to do Spirited away (which I did a speed paint of- click the link to find out) or watch below. This was done on better paper and It was REALLY Fun. I just realized though that it was crooked. And I kinda love how lopsided it looks. Maybe because I have a topsy-turvy style. Full version of howl up in the link of his name. 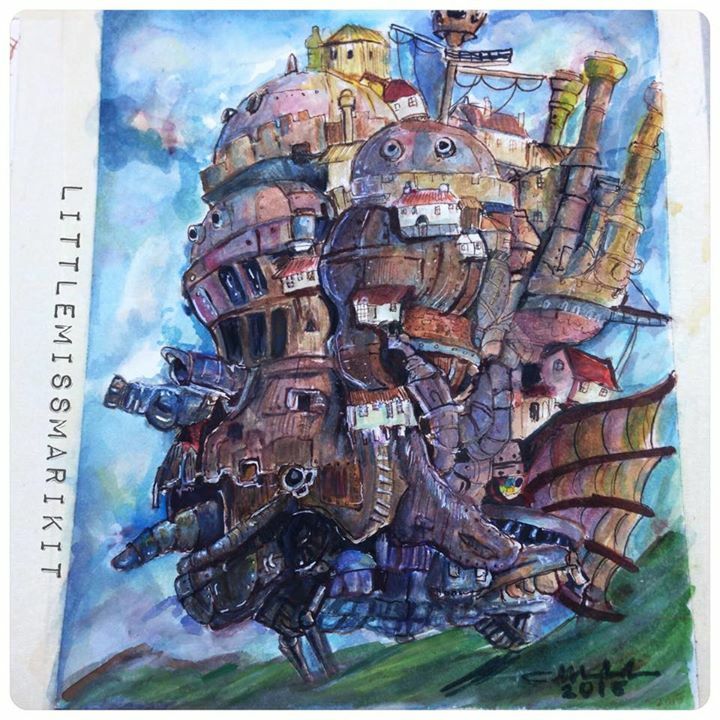 Another Influence of mine is Yoshitaka Amano (Who they said I had a similar style to ) If so, THANK YOU. My reference photo also didn’t have his staff, so I had to add that in. rendering wood is annoying and so with leather, but i managed to pull it off without ruining the paper. I work rather wet. So i need to tone down the water when I paint. I also have to remember that the paint dries LIGHTER than when it’s wet so I dont get paranoid when working on it. 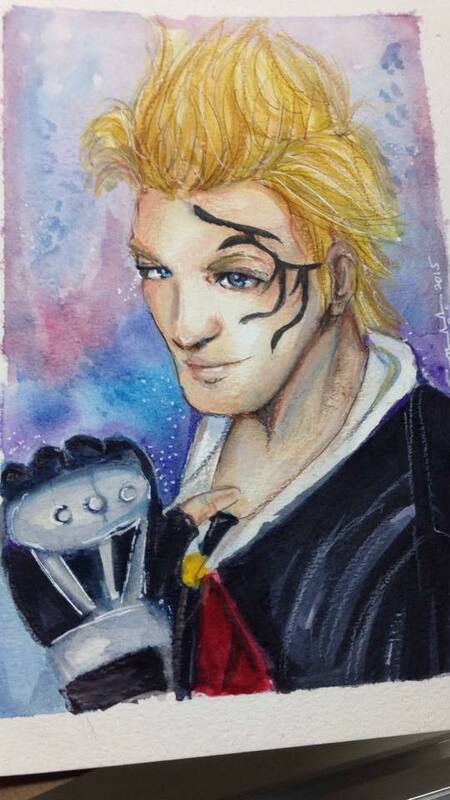 Another notable FF Character I did was Zell who I did as a Commission for a facebook client. Zell was kind of tough to do. I had to use mixed media to get the hair right and copic some of his details, but I love that background on him. I realized that the eyes are weird but he loved it anyway. I should really be careful with anatomy next time,and NOT PAINT WHEN SLEEPY. All in all, I have been enjoying my watercolor studies and I hope that I can master more techniques from BGs to portraits to still life (yes, still life) I want to do it all. I AM willing to learn if you have any questions, comments, critiques or suggestions. Just say it nicely! And thanks for reading my babbling.